Sure, we've all heard about Team Type 1, and the media loves to depict them as the poster children for what people with diabetes should be. But to some extent, there is also a backlash, too. There are legitimate critics who claim that they are being exploited by the media and by drug and medical device companies looking to position their insulin or insulin pumps as somehow "enabling" their adventures, when the real enabler is their youth and motivation, not diabetes or their endorsed products. No doubt, the members of Team Type 1 disagree, but to some extent, when you use the media to call attention to your accomplishments, you also have to take the criticisms, too. But another adventurer is not quite the picture of youth, at 40 years old, and to a large extent, has shunned the spotlight (except in his hometown of Pittsburgh). This morning's Pittsburgh Post-Gazette features a story on the middle-aged (and perhaps, more modest) version of Phil Southerland: Will Cross. Will Cross has largely avoided the spotlight, yet climbed Mt. Everest, becoming the first person with type 1 diabetes ever to do so. His next adventure, climbing the peak of Lhotse, the world's fourth-highest mountain, is slightly more modest, but is nevertheless inspiring. Although 1,095 feet shorter than Everest, Lhotse is steeper and requires more technical climbing ability. Insulin storage - wrap the bottles or delivery devices in aluminum foil and mark using sports tape. This will insulate and protect the insulin from a hard knock. Use a small coffee thermos to protect from the heat or the cold. Foot care - inspect feet daily and use a foot powder recommended by your MD. Clean socks are imperative. Clean your nails and between the toes with the alcohol swab used for injections. Eye care - wear good shades; spend the money to protect those retinas. Skin care - take some good body lotion if prone to dry skin so as to avoid cracked skin and infections. Use an spf 30 with UV A and B protection when on water, snow or in the mountains. Hypoglycemia - energy gels such as PowerGel, Gu, or Cliff Shots offer a predictable amount of carbs in a fast absorbing form and easy to carry packet. Hyperglycemia - drink fluids to flush out the sugar and ketones. This will require extra cooking fuel so plan ahead. You may have to delay your start time so as not to stress the body while high. Partner - have a good one who is informed about your diabetes and how to treat and recognize highs and lows. Do not go solo. Have them carry the gels too. Travel - when international, have an MD note in the local language that explains why you have needles, strips, a blood meter and so on. Most language teachers and some computer programs can translate for you. Do not place your meds in the cargo hold of a plane as they will freeze. Instead, split your load in half and have your partner take some and you the rest. If a bag is then lost or stolen you still have meds. Take extra scripts in the event that everything is lost, delayed or stolen. Consider wearing a Med Alert bracelet or necklace with internationally recognized Med Alert sign and contact info. If you pass out, this will be the only clue for an unsuspecting helper. Blood testing - test early and often when in a new environment, time zone or activity. Write down the results, record the new diet and notice trends so that you can function at your best. In the cold, protect the strips and device deep in your sleeping bag and warm it up under your arms when ready to test. Bring a back up device. Tomorrow, a Pittsburgh adventurer with type 1 diabetes will embark on his next challenge: scaling Lhotse, the world's fourth-highest mountain. Will Cross, 40, already has trekked to the North and South poles and climbed the highest peaks on the seven continents, including Mount Everest. He's the first person with type 1 diabetes to accomplish such feats. A professional adventurer, he receives financial sponsorships from companies involved with diabetes care, including insulin producer Novo Nordisk Inc., and Animas Corp., which produces insulin pumps, along with Kobold Watches of Pittsburgh. The University of Pittsburgh Medical Center and Diabetes Institute also have studied Mr. Cross, who has shown no adverse health reactions to his expeditions. He's proven that being fit and prepared, along with maintaining good blood sugar levels, eating the right diet, and protecting his medications and diabetes gear, are necessary in high-risk adventures. He also does motivational speeches on living with diabetes and refusing to let the disease undermine one's goals. His website is www.willcrossmotivates.com. Once he arrives in Katmandu, Nepal, he'll spend weeks preparing for the trek, hiking and acclimating his body at high altitudes, before he attempts the weeklong Lhotse climb in May, when weather and wind conditions provide a brief window of opportunity for climbing. An unexpected challenge may arise from climbing restrictions enacted through May 10 as part of China's effort to avoid "Free Tibet" protests when it sends climbers bearing the Olympic torch to the summit of Everest from the Tibetan side as a prelude to hosting the 2008 Summer Olympics in Beijing. Because Lhotse, which is on the border of Nepal and Tibet, shares some climbing camps with Mount Everest, its climbers could be affected. If that happens, Mr. Cross said he'll turn his attention to climbing another Himalayan peak. It took him three attempts to reach the summit of Mount Everest, finally accomplishing that feat on May 23, 2006. His current goal is the Giant Mountain Challenge, which involves scaling six Himalayan peaks higher than 26,000 feet, the first of which is Lhotse. His first attempt at Lhotse last year ended about 1,000 feet short of the 27,940-foot summit -- or 5.4 miles high. He turned back because of unfavorable weather and snow conditions. "My job is to manage risk and assess it accurately," Mr. Cross said. "Last year, I assessed the snow, and it was not the right consistency. It didn't feel right. "It's tempting, when you put two months and the money into a climb, to go for it, but then you're not managing the risk but ignoring it," he said. "That's when you get into trouble. It's like a drunk driver getting into a car and turning on the ignition." Although 1,095 feet shorter than Everest, Lhotse is steeper and requires more technical climbing ability. 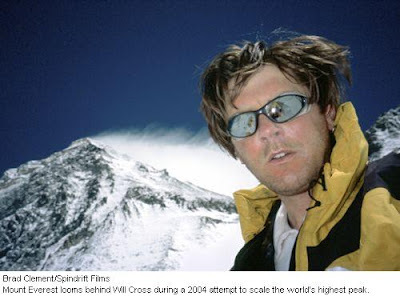 "As with Everest, you don't get to make mistakes," Mr. Cross said. "You have to know when to go home." That's particularly important for Mr. Cross, who has a wife, Amy, and six children ranging in age from 3 to 17 -- or as he puts it, "from Huggies to hormones." Once in Katmandu, he'll trek for 10 days, going from elevations of 9,000 to 17,000 feet. He'll make partial climbs to acclimate his body to thin air and the weaker gravity, then return to base camp. Once he's acclimated and conditions are right, he'll begin the main climb. His diabetes adds to the considerable challenges. Type 1 occurs when an autoimmune response damages or destroys insulin-producing beta cells in the pancreas. Without enough insulin, which allows blood glucose to enter cells, blood sugar levels rise to dangerous and eventually deadly levels. Controlling one's blood sugar is a daily challenge for anyone with type 1, let alone one who climbs mountains. A too-high insulin dose causes blood sugar levels to dip to dangerous levels, causing one to lose coordination and ability to think coherently. Known as hypoglycemia, low blood sugar can lead to unconsciousness and death. Mr. Cross also must wrap insulin supplies in aluminum foil and athletic tape for storage in a thermos to prevent freezing. With temperatures dipping as low as minus 30 degrees Fahrenheit, he must sleep with his insulin to keep it warm. While climbing, he's unable to test his sugar, so he takes glucose gel throughout the day to maintain a healthy level and generally "grazes" all day long on cheeses, dry meats, chocolates and high-calorie fatty foods to maximize calories and counter the cold weather. The diet goes counter to general recommendations for people with diabetes who typically are advised to eat foods low in sugar, carbohydrates and fats. Even though he eats fewer calories during a climb, he still takes extra insulin because stress and environmental conditions cause blood sugar levels to rise. He said his appetite drops during a climb, adding another uncertainty. "I always have to have food on my person," he said, noting the importance of drinking lots of water. "The big thing is anticipating my [blood sugar] lows. I cannot afford not to be functional." Mr. Cross said the Lhotse climb is important to his continuing effort to demonstrate that diabetes, when properly managed, doesn't have to block one's goals. David Templeton can be reached at dtempleton@post-gazette.com or 412-263-1578. Very cool stuff. I love reading about Will Cross. I need some clarification on one of the tips though - I'm just not making the connection. "Hyperglycemia - drink fluids to flush out the sugar and ketones. This will require extra cooking fuel so plan ahead. You may have to delay your start time so as not to stress the body while high." Oh! NOW I get it. I bet they have to boil snow and/or other water to purify it. They need the extra cooking fuel to get it boiling. Scott, I would assume that your assumption is correct on the need to boil the water (likely just to put it into a liquid form), but I wasn't 100% sure about that one myself! Will Cross is awesome. But is it necessary to slam Team Type 1 as part of your praise of his accomplishments? I wouldn't attribute their success merely to "youth." Phil was diagnosed with diabetes at 7 months and is an inspiration to many. Any media attention and financial support is 100% deserved in my opinion. Cycling is expensive and any professional cycling team needs sponsorship. All the better that diabetes-related companies are helping out in this way, in my opinion. And I personally am more motivated to go for my athletic goals because of the work these guys have done! Thanks for your comments. I am curious, however, why is it that anytime someone reports anything that is even remotely controversial that it's interpreted as "slamming" Team Type 1 (especially since I've supported them for 3 years now)? Some people believe that they being used by their sponsors. In fact, a letter to the Tallahassee Democrat (the local paper) last year raised this issue, not me. My own thought is that they knowingly chose to endorse products fully cognizant of what they were doing. But, the implicit message with an endorsement (vs. a sponsorship) is that Apidra insulin made by Sanofi Aventis, Abbott Diabetes Care (Freestyle meters), or Omnipod insulin pumps enabled them to compete at that level is also misleading. Are you saying that they could not have accomplished the same thing with Eli Lilly & Co. Humalog insulin, Johnson & Johnson One Touch meters, or Medtonic Minimed pumps? I doubt that. I agree that they have earned whatever recognition they've received, but its fair to acknowledge the difference between corporate sponsorship and an endorsement. I reread your post and realize I over-reacted a little--I apologize. But I still wonder if it is necessary to introduce such a fine person as Will Cross by first discounting some of the success of TT1 to "youth." It just sets off the whole thing a bit negatively. I think it’s important for all diabetics to understand that the disease doesn’t prevent one from accomplishing his/her goals in life. There may be a need for some cheerleader-types to convince others that goals are attainable. There are thousands of Type 1 diabetics who have attained great accomplishments in life that we never know about because they refuse to allow themselves to be exploited by our charitable organizations and diabusiness. Have you noticed how Lilly and Novo sponsors those who achieve ‘in spite of diabetes’ while ignoring those whose lives were foreshortened by the disease (or the modalities of treatment). Think of the tremendous investment—individual fortitude, time, money—that some will consider as wasted ‘wealth’ in the pursuit of ego-enhancement and self-aggrandizement. All this investment benefits only those who want the message to be perceived as “Diabetes is cured.” When is the diabetic population going to rise up and say, “Stop using us as pawns in a diabusiness Ponzi scheme to keep us imprisoned by this disease that is curable.” All the monies raised by such events and ‘celebrities’ is usually spent on new maintenance schemes and further fund-raising. CURE is truly NOT part of the equation. Hooray for the cheerleaders, though. We have one in the White House. What a fine example he has set down. You seem to be cheerleading for the cheerleader; thus is the important message trivialized--the need for a cure. Sorry, but I believe those who have the opportunity to speak out about the need for a CURE, but fail to do so are part of the problem. When they stand before the media and expound on their success--while LIVING with diabetes--they merely disseminate corporate propaganda and aid corporations benefitting from disease maintenance instead of disease cure. First I wanted to apologize for my previous criticism of your post--I have regretted writing what I did. Indeed, you are correct that Team Type 1 is advertising for their sponsors, and perhaps many would see this as the sponsors exploiting them. I think the difference between TT1 and any other cycling team (that also has sponsors) is that the products they are supporting are so integral to our health and even our lives that is a much more personal thing than a pair of sunglasses or some shoes. Here's why I reacted the way I did. I also have some athletic dreams not unlike those of TT1. Getting sponsorship to pursue these dreams is required unless one is independently wealthy. So if some diabetes companies are lining up behind these guys and giving them lots of money because of the T1 angle, I say go for it. It is so tough to get financial support for these types of things!! And it is the same with other types of sponsorships for any team. Do you think everyone on a team sponsored by Trek absolutely loves Trek? They could be successful on other bikes of course, but this is where they get the money and they are obligated to support them. If a respectable company said, "I am going to sponsor you and support you so you can get the medical advice and coaching as well as the gear you need to pursue your dream of reaching your optimum performance as an athlete," I would have a pretty tough time turning it down! And, Melody, I agree that finding a cure is #1 (which is why I raised >$4k for JDRF last year) and that there are many people who do amazing things that are not in the spotlight. But TT1 has been a personal inspiration to me, as well as my dad who has type 1, in those moments when my confidence shakes a little and I think, can I keep doing this? Can I really reach my goals? Is it possible to do this with diabetes? Also, you should know that many of the TT1 riders are big supporters of the JDRF and encourage many to raise significant amounts of money for a cure.